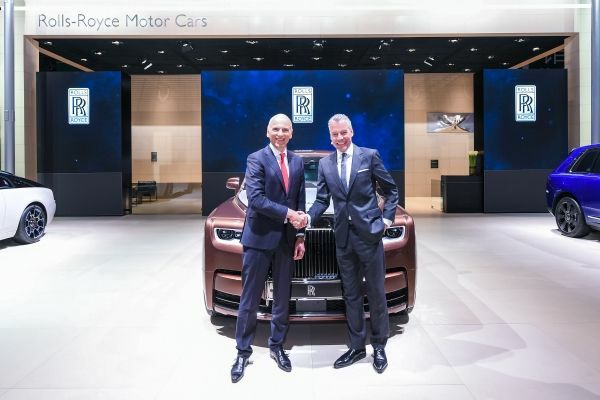 The Greater China market played a significant role in the marque’s 2018 success story; becoming Rolls-Royce’s second-largest market. It is anticipated that the market will, at some point in the not-too-distant future, become Rolls-Royce Motor Cars’ largest single market. As the world’s top luxury brand, Rolls-Royce is gaining ever increasing favour amongst young, ultra-high-net-worth Chinese customers who are attracted to the brand’s youthful model range, and exceptional personalisation options. Phantom, which is Rolls-Royce’s pinnacle product, sells more in China than anywhere else in the world. Rolls-Royce Motor Cars returns to Shanghai Motor Show this year with a breathtaking line-up, showcasing the near-infinite Bespoke possibilities of the brand. Every Rolls-Royce is hand-built at the Home of Rolls-Royce in Goodwood, England. Phantom Extended Wheelbase featuring the Privacy Suite will be at the Shanghai Motor Show for the first time together with Cullinan, Ghost, and the edgy and menacing Wraith Black Badge, demonstrating the width and breadth of true personalisation that only Rolls-Royce can offer. Crafted for those seeking sanctuary and privacy within the rear compartment of their Rolls-Royce, the Phantom Extended Wheelbase featuring Privacy Suite, is an innovation that provides unrivalled levels of privacy and luxury for the Marque’s discerning patrons. Regal Bronze bodywork is partnered with a Silver Satin Bonnet and a single Seashell White Coachline, offering a stately and elegant stance. The colour theme continues into the interior, with Smoked Eucalyptus and Silver pinstripe veneer complementing the Dark Spice and Seashell leather. Cascade of Steel embroidered door panels elegantly match the Phantom’s Gallery, resulting in a truly bespoke masterpiece. The Privacy Suite, exclusive to the Phantom Extended Wheelbase, is a perfect showcase of Rolls-Royce Motor Car’s ability to provide clients with a truly luxurious and private experience blended with cutting-edge technology. The effortless touch of a button partitions the rear cabin from the front with Electrochromatic glass, allowing the rear passengers to instantly transform the glass wall from transparent to opaque, providing a highly sophisticated and absolute level of privacy. The fully integrated Intercom System provided in the Privacy Suite allows the occupants to open a direct line of communication to the driver at the press of a button. The driver has the opportunity to ‘call’ the rear occupants at any time, whilst the passengers can choose to answer or reject the communication. Rear Privacy Curtains have also been added allowing full closure of the side and rear windows as well as Rear Privacy Glass, extending discretion when the curtains are open. The Bespoke Ghost Extended Wheelbase on display in Shanghai represents the true duality exhibited in this extraordinary vehicle. Combining elegant design cues from the past with contemporary style, Ghost stands as the unequivocal choice of pioneers, entrepreneurs and tastemakers as they continue to blaze a path in their chosen career. Nowhere in the world is this clearer than in the Chinese market. Ghost was the top selling model in the Greater China Market in 2018 and continues to prove popular with the society’s entrepreneurs and businessmen and women. A Burnout Grey body is adorned with a single Armagnac Coachline. The theme continues into the interior, with Armagnac and Black leather hides providing a two-tone colour scheme. Selby Grey piping and stitching provide contrast, highlighting the serenity found in this extraordinary motor car. This is combined with a Brushed Metal fascia, displaying the elegance of Ghost Extended Wheelbase as the top executive sedan that continues to provide patrons the opportunity to explore the limits of Bespoke by challenging the artisans at the Home of Rolls-Royce Motor Cars in Goodwood. Cullinan is the result of years of collaboration with patrons and clients alike. Rolls-Royce refused to enter the market with anything less than perfect and Cullinan has delivered. Launched to global acclaim last year, Cullinan received effusive headlines in the media, as well as an enthusiastic welcome from patrons. The Shanghai 2019 Bespoke Cullinan on display is a symbol of what the craftspeople at The Home of Rolls-Royce at Goodwood are able to achieve given a machine of exquisite artistry. Consummate in Salamanca Blue, with its crystal effect exclusively developed by Rolls-Royce, echoing the dazzling light and beauty reflected in the car’s namesake – the biggest diamond ever discovered. In line with the simple and concise design, the interior colours are Selby Grey, Black and Cobalto Blue. Bespoke Shanghai Motorshow 2019 treadplates pay homage to one of the most vibrant and forward-looking cities in the world. The new, advanced Bespoke model illustrates Rolls-Royce’s concept of luxury travel over any terrain, providing a perfect choice for motoring in the great outdoors, bringing discerning customers who wish to travel in style and grace, be it to the opera, to polo, or across the amazing and vast outdoors of China. Wraith Black Badge speaks to the darker, more assertive, confident and demanding aesthetic of a new breed of Rolls-Royce customer – today’s generation of young, self-confident. trendsetting, cosmopolitan citizens of the world. This alluring guise has attracted the attention of Rolls-Royce’s younger, self-empowered, Chinese Patrons. These customers seek adventure and are unapologetic in their choice of lifestyle. Wraith Black Badge is the ultimate gentleman’s GT. A motor car with passion and a darker alter-ego. The Selby Grey over Black Diamond exterior of the Shanghai 2019 Bespoke Wraith Black Badge is complimented by a feature coachline and wheel pinstripe in striking Mugello Red. Selby Grey seat and door piping harmonises seamlessly with the exterior and the starlight headliner with red hue adds a dramatic intrigue never before seen on a Rolls-Royce. Visitors are welcome to visit the Rolls-Royce stand (8A08) in the 8.I Hall to appreciate the ultimate in luxury and Bespoke from Rolls-Royce.